I don't know how any of us are supposed to survive the cliff hanger and manage to live our lives until the release of book three. I finished book two and was thinking about Fayre, Rhysand and Tamlin for days. I was a totally book zombie and all I wanted was to start the next book right that minute. When I couldn't take it anymore I decided I'd do the next best thing and start writing the start of book 3 myself. 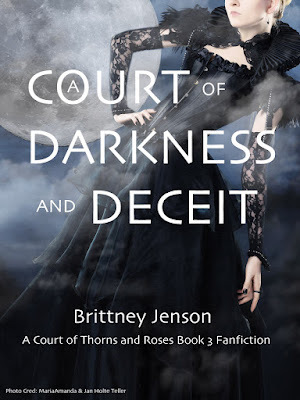 "A Court of Darkness and Deceit"
* P.S. 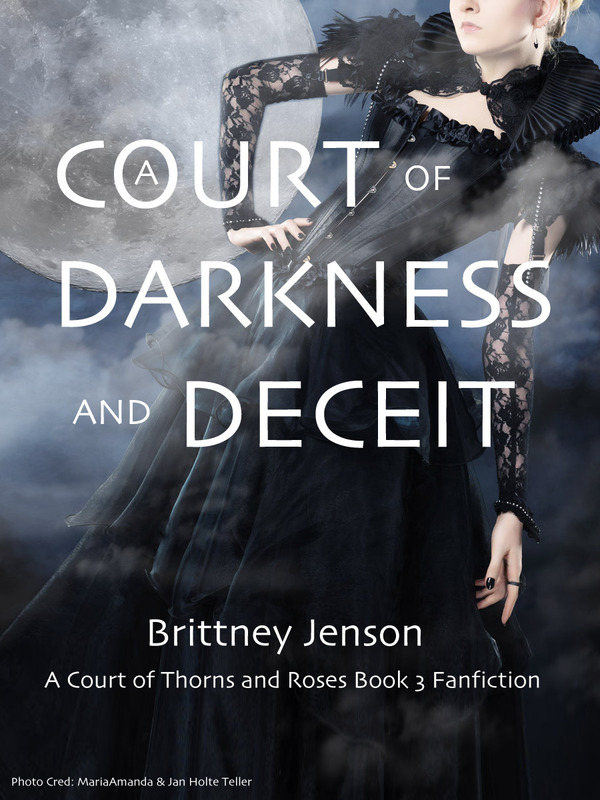 Lots of spoilers for "A Court of Thorns and Roses" and "A Court of Mist and Fury" Don't read this if you haven't read them both first. I smiled dreamily at him before giving his hand a squeeze, “Thank you for bringing me back,” I said softly before starting up the staircase. Back so I can destroy this court and make you pay for what your pride and selfishness has done to everyone. I could feel his eyes following me and I turned my head slightly so I could smile one more time. He grinned at me again before finally turning on his heels and striding back through the entryway. I took my time walking to my old rooms noticing the changes in the manor. I had no doubt that Tamlin had ragged, probably often, in my absence and there were little tale tell signs of it all around the manor. The hallway was lined with new paintings, there were also chipped vases, and the banisters were subtly gouged. I wondered how recent his latest attack had been, perhaps when I had refused to return with Lucien? I finally reached the door and entered my room. Alis was there waiting. Her stare was intense as she took in my every detail, noting my Illyrian fight leathers, my fill out, healthier looking, form, and my left arm, bare of the twisted black tattoo. “I’m back, and I’m safe,” I said before she had a chance to say anything, to ask anything. “You have nothing to be sorry about,” I replied gravely. “The High Lord of the Night Court is not someone who is easily denied.” She nodded again, but still looked bleak as she helped ready me for bed. She finally left and I found myself walking over to the window and opening it wide. Quiet chittering of spring creatures called out to me as a warm, mild, breeze blew into the room. Gone were the familiar sounds of a thriving city with beautiful midnight orchestras. My heart felt heavy as I scooted closer to the window to gaze at the stars that were the same. Rhysand’s stars. Court of Dreams’ stars. I wondered if he would be looking at them too. I sat for a long moment by the window staring at the darkened sky while I began making a plan to bring the Spring Court and its Lord to its knees. I would have to be crafty. I would act as I were the lead in a Court of Dreams play. I needed to be forward enough to get into Tamlin’s meetings, but meek enough that no one would suspect a thing, and when the time was right I would have my revenge. I left the window open as I walked to the bed and pulled back the thick comforter, climbing into the crisp white sheets of my bed. I lay waiting for sleep to claim me and fearing what new terrors my dreams would paint for me after what the King of Hybern had done to my sisters. I was still awake when there was a soft tap at my door. I didn’t respond and instead tried to make my breathing sound deep and even. After a moment the door opened anyway and my ears strained to hear the sounds of Tamlin prowling to my bed. He pulled the covers up and soon his warm body slid in next to mine. In spite of myself my heart racket up a notch, and Tamlin’s keen ears seem to notice my drumming pulse and mistook the sound of my dread at his nearness for excitement. He slid a warm hand over my stomach and moved to press his body up along side mine. My breath hitched a notch and I tried not to shudder at the feeling of his lips on my neck and his hand slowly moving up my abdomen and along my rib cage. “The night he took you I thought I’d die of rage,” he whispered silkily in my ear. “After everything you went through, after all you sacrificed, for all of us, you of all people deserve to feel safe, to be safe, and he destroyed that. That night I vowed I do would do whatever it took to get you back, safe, no matter the cost. I’m sorry it took so long.” He pressed his nose to my neck and slowly ran the tip of it up to my ear trailing soft kisses along the path until he reached my lobe and began to softly nibble at it. It took more willpower than I realized I possessed not to grind my teeth at his speech. Not to shove him away from me and drown him with water wolves for what he’d done, for selling out not just Rhysand and the Night Court, but everyone, the whole human and faerie realm alike. Tamlin’s voice was rough, strained, hesitant. He sighed heavily before answering, “I did everything I could to find you on my own, but when Lucien came back from seeing you at the Night Court I knew the only way I could save you was to align with the King of Hybern. I didn’t like it at first, but he made some good points for an alliance. Even the queens of your realm couldn’t deny his masterful ideals for the future. There will be a lot of changes coming, but rest assured we’re allied with the right side. Perhaps there can finally be lasting peace when the wall falls. And your sister are already immortal, soon they will be safe too.” This time I did shudder at the sincerity and self righteousness in his voice. “We’ll get them back, and we’ll make him pay,” he said misinterpreting my reaction. His hand started moving down my waist, and over my hip to rest on my my thigh. His dexterous fingers began slowly inching up the fabric of my nightgown until he was able to caress the bare flesh beneath it. His fingers felt like spiders roving along my skin and goosebumps appeared beneath his touch as my body was hyper aware of each motion of his hand, each brush of his fingertips. I silently screamed out against the invasion. Everything was wrong. His caress was wrong, his nearness was wrong, even his scent was wrong and each touch made me want to gag. I wondered how long I could fake loving him, how long I could withstand his touch when every ounce of my body seemed to scream out against it. Rhysand had been able to fool Amarantha for fifty years, would I be able to fool Tamlin even once? Could I force my body to respond to him? Force the chemistry? “What happened in the Night Court?” he asked softly, trailing kisses along my jaw and subtly moving my face closer to his. “I don’t want to think about it right now,” I whispered, and he nodded his understanding before pressing his warm mouth to mine. I tensed at the initial brush of his lips, but forced myself to return to pressure, to move my mouth with his, to press my body closer to him. My head ached with the wrongness of it but I pressed forward in spite of it. Tamlin’s mouth opened and mine followed suite. His tongue swept behind my teeth in a dance of demanding passion and even while I tried to keep up, my tongue retreated. His hands began running possessively along my sides demanding me closer, one pulling against my back as the other sunk lower, teasing along the hemline of my under garments. One finger brushed below the hem and I jerk away involuntarily. Tamlin immediately relaxed his hold on me, pulling back to look into my eyes. “What’s wrong?” he whispered. I stared back at him, my mouth opening and closing. “I… I don’t… I can’t… Tamlin... I think he might have done something to me,” I whispered hating myself even as I said the words. Tamlin’s eyes immediately darkened, and a low threatening snarl rumbled from his throat. “I need a little bit of time to make sense of everything. It all just feels so raw and confusing right now,” breathed. I nodded and gave him a small grateful smile and breathed a sigh of relief as he dropped his hands away from my waistband. He laid back on the pillow and tucked me in next to him, my skin tightly pressed to his. I laid there a long time listening to his breathing, only relaxing a bit when it finally deepened in sleep. Then I reached out to the small part of me that was Rhys, feeling along our bond and mentally crying out for comfort and forgiveness from him for what the next months would bring.